It's important that all drivers on the road do their best to be courteous and considerate of others. By doing so, they help ensure a proper flow of traffic and as little potential for danger as possible. And yet there are many motorists who do not act considerately and, in the process, make the roadways dangerous for multiple parties. When such actions result in injury, it's important to seek legal counsel. A personal injury attorney can help accident victims and their loved ones obtain just compensation for any losses that have been sustained. Right now, we would like to consider the dangers that aggressive motorists pose to others. This goes for other motorists as well as others who share the road. Aggressive drivers refer to those on the road who drive without regard for the safety of others. They may actively be attempting to dominate the road and make normal driving a hassle. 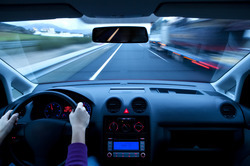 Many kinds of injuries can result from aggressive driving. If a person is being tailgated, for instance, a rear-end auto accident is likely, which can result in whiplash and other issues with the neck. Sometimes when an aggressive driver is changing lanes frequently, it causes motorists to change lanes suddenly to avoid being hit. This can make the motorist get run off the road, or it can cause sideswipe accidents with other innocent motorists. In severe collisions, motorists may lose their lives during collisions. This is often possible when multiple vehicles are involved in collisions. Aggressive drivers don't just threaten other motorists. If there are aggressive behaviors on city streets, this can potentially harm pedestrians and bicyclists as well, who are very vulnerable to serious injury. Any time recklessness or negligence are the cause of an auto accident, it is extremely important that you speak with skilled attorneys about your legal options. A car accident attorney will take reckless and aggressive drivers to task, and make sure that they are held responsible for any damage, injury, or loss of life that they have caused. We are here for you in your time of need. If you would like more information about your legal options after a serious motor vehicle collision, be sure to contact our San Diego personal injury law firm today. Our entire team here looks forward to meeting you in person and helping you receive just compensation for injuries and other losses that you may have experienced.